As a child, Richard was always fascinated with helicopters and airplanes. While attending his freshman year at a local college, he realized his interest and affinity for still photography. As a result, he started working at a studio specializing in Aerial Photography. Richard started in customer service, then worked his way up to Head Photographer within 4 years. 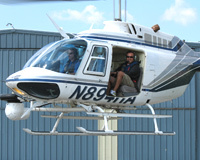 During those 4 years, he became proficient in all aerial photography and site location techniques, as well as the WESCAM Video system. Richard has traveled as far north as Boston and as far south as Florida executing a wide variety of photography and video projects. Richard's former supervisor was once quoted as saying, "It took me 18 years to learn aerial photography but it took me 4 years to teach it to you." Finally in late 1999, Richard resigned from his position at the studio and decided to continue his education at Professional Resource Management, where he added web site design and database management to his growing list of professional and creative skills. As he neared graduation from PRM, Richard was approached by Whit Baldwin of HeloAir with an offer to become HeloAir's exclusive photographer and WESCAM Operator. Richard accepted Whit's offer without hesitation and immediately founded his own company (New Media Systems, Inc) specializing in Aerial Photography and creative design services. With Baldwin's knowledge in business and aviation, he was able to help Richard navigate the hurdles that arise when young entrepreneurs decide to start a new business venture. Almost seven years later Richard has logged over 4000 hours as an aviation passenger and is a Pilot himself. Through his affiliation with HeloAir and other clients, he has enjoyed the unique opportunity to engage in a variety of exciting aerial photography and video projects up and down the east coast.